Here at Food Box HQ we have one main goal, and that is to help you pick the best meal delivery service. To do this, we test and review tons of different meal kits ranging in price, diets accommodated, and more. Don’t want to read our full 3,000 word review of the 10 best meal delivery services? Click here to view our top pick. It can be overwhelming trying to figure out which service is right for you. Not only are there hundreds of different companies out there, some bigger than others, and they all have different specialties. I was once in your shoes, trying to figure out which kit was worth my hard earned money. That’s exactly why I decided to create this site. Below you will find our top picks, based on our comprehensive reviews that take into account a number of different elements including, but not limited to: food quality, overall taste, price per serving, delivery areas, money back guarantee, diets accommodated, and if there are any delivery charges. Even though the meal delivery services below represent our top picks, we will be as unbiased as possible and include any downsides we think you should know before purchasing. We are also updating Food Box HQ regularly so this list may be subject to change periodically based on our most recent reviews. So check back often! While not the most well-known meal delivery service around, Sun Basket is one of our favorites. Some meal delivery services focus at being good at one or two main things (e.g. ease of ordering, packaging, or price). However, Sun Basket has figured out how to be great at just about everything important when it comes to meal kits. First, let’s talk about what makes Sun Basket unique. Their main focus is providing customers with high-quality, organic, and sustainable meals. Each Sun Basket meal we had the pleasure of trying wasn’t just delicious, it was actually pretty healthy too. It’s easy to pack a meal kit full of junk ingredients to make it taste better. It’s much harder to turn healthy ingredients into something tasty. The majority of the plans above are self-explanatory. The “Lean and Clean” option delivers you meals that are nutritionist–approved with typically 500–800 calories per serving. Lastly, and one of the most important aspects to consider when deciding, is how recyclable Sun Basket is. They were the first company to debut a 100% recyclable and compostable package in the meal delivery industry. This is a huge milestone considering how much waste meal delivery kits can contribute to the environment. I hope to see more companies invest in sustainable packaging like Sun Basket has. Out of all of the meal kits we’ve tried, we have saved Home Chef recipe cards the most. This is for two reasons… First, they’re quick and easy to make. Second, they taste really good (especially considering most have only taken 20 minutes to cook). Another thing that Home Chef really nails is the quality of their ingredients. Every ingredient we’ve received has been top-notch. Nothing has arrived rotten or outdated. They put a lot of effort into ensuring their kits are free of any issues (e.g. expiration or damage) which can be a huge undertaking considering they probably send out hundreds of thousands of meals per month. Lastly, Home Chef recipe cards are some of the best we’ve seen. Not many people think about this aspect of meal delivery but it’s crucial to the whole experience. Some companies just throw together recipes onto flimsy paper that can get destroyed when cooking, sometimes the text is too small to read, and we’ve even seen some recipe cards even have the wrong information. Home Chef’s recipe cards are super simple to follow. They are designed in a way that breaks down every aspect of cooking the meal into easy steps that are accompanied by an image. The incorporation of images means you can look at the recipe as you’re cooking, not needing to read the text, and still know what you should be doing. Chances are pretty high that you’ve heard of Blue Apron before. They’re easily one of the biggest meal delivery services around for a reason — they have the financial backing to create an amazing service. Not only are they one of the highest valued meal delivery services around but they have also been around in the US for much longer than the others. Thus giving them a big head start. Having been around for so long, Blue Apron has been able to perfect all of the essential elements of a meal delivery service. Everything from ordering on their website to their recipe card is streamlined and simple. The one thing we enjoyed most about Blue Apron is the uniqueness of their meals. They’re both fun to make and delicious. I think it would be a great activity for a family of three or more to do together. Another thing that makes Blue Apron fun and a bit different than the other meal kits out there is the fact that you can have wine perfectly paired with your meal. This is more of an added bonus than something that’s a necessity when it comes to meal kits. The only minor issue that arose with Blue Apron is concerning organization of ingredients. Many meal kits put the ingredients of each meal inside the package together in a small bag or box. This makes it easy to unpack your meal kit and keep everything organized in your fridge for when you need to cook. However, Blue Apron just delivers all of the ingredients to all of your meals in one box. This just adds a little more time to the prep and cooking because you need to rummage through all of the ingredients to pick which are needed for the meal. 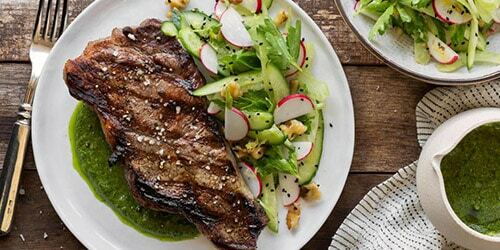 Like Blue Apron, HelloFresh is another incredibly well-known meal delivery service that has been around for a long time. What’s funny is while the two companies look different on the outside, they share a lot of the same elements: both are the biggest meal kits in the industry, both allow you to pair wine with meals, and both send fun/unique meals. What I like most about HelloFresh is the fact that they organize everything in their meal boxes so thoroughly. All of the ingredients for each meal comes in a small box that can easily be packed away in your fridge for when you need to cook. That allows you to save some time in the long-run. Money Back Guarantee: No, but they state in their terms and conditions that “we may, in our sole discretion, issue a credit to your account”. If you’re a fan of the hit show “Shark Tank”, there’s a chance you know of Plated. That’s because they originally got their start (or at least a big bump in popularity) after appearing on the show. Plated impressed me. While they look like one of the “big guys” (e.g. 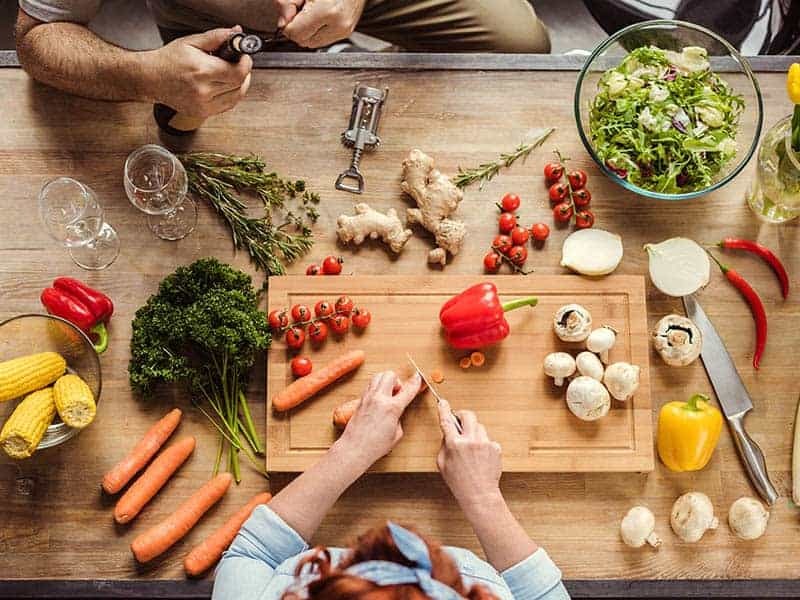 Blue Apron and HelloFresh) they focus on one key thing in every meal they send — quality. That’s not to say the others on this list don’t but Plated really puts a lot into ensuring that their ingredients are on the highest level. All poultry is raised without antibiotics, fish is sustainably caught, produce is seasonal, and beef is raised without hormones. To give you an example, instead of sending us regular butter to use in our first meal, they sent us grass fed butter, which is a much healthier option. These small details might go unnoticed by many people but they add to the overall cooking experience and taste of the meal. Chef’d might be the biggest least known meal delivery company on the market today. And even though they are so big, they’ve managed to retain a high standard of quality when it comes to their meals. One look at their website and you’ll see what I mean. They have meal plans for just about everyone… Paleo, vegetarian, diabetics, and so much more. The way they’re able to do this is by partnering with big brands and organizations such as Munchies, NY Times, and even Wolfgang Puck (to name a few). Another advantage of using Chef’d is that they allow you to choose whether you’d like to be on a subscription plan or not. This makes it super easy if you just want to try them out once or twice without committing to a subscription like many of the other meal kit companies make you do. The only downside to going with Chef’d is that they don’t prioritize recycling or green packaging the way that some of the other companies on this list do. Healthy meals are important. It can be very easy for a meal kit service to put together junk food meals that are cheap and taste good. If you’re into that, no judgement here. However, if you’re looking for tasty meals that are also good for you, Green Chef is probably one of the best around. They have niche meal plans such as keto, paleo, vegetarian, vegan, and gluten-free. And, of course, they also have omnivore as well as a pure carnivore meal plans. Like many of the other companies on this list, the majority of their meals are certified USDA organic and only use non-GMO ingredients. “Green” is in the name so it isn’t surprising that they take green packaging very seriously. Everything that they send your meals in is either recyclable or compostable. To give you an example of how invested they are in sustainability, the insulation they use in every package is 100% plant-based and can be composted. The only minor downside is that they don’t emphasize quick prep and cooking as much as some other companies do on this list. That’s not to say cooking their meals will be a chore or will take hours but they are slightly more involved than some of the other companies on this list. However, they do help out a bit by sending some ingredients pre-chopped. One of the number one reasons people decide to commit to a meal delivery subscription is because they’re looking to save time. Anyone can go online, search for recipes, drive to the grocery store, buy ingredients, and cook a meal. But it’s a huge process that drains a lot of time out of your day that could otherwise be spent more productively. If you’re looking to save as much time possible with cooking, Freshly is the meal kit to go with. They are one of the few popular meal delivery services that deliver you pre-made meals. Plus, they’re actually good for you! This is because, unlike those pre-made meals in the freezer isle of your local grocery store, Freshly meals are cooked and immediately shipped to you. They’re never frozen so there’s no preservatives or extra sodium to keep them from going bad. There are only two drawbacks to going with Freshly. First, they don’t ship everywhere in the United States yet. Second, their meals cost a little more than the other meal kits on this list because they’re pre-made them for you. 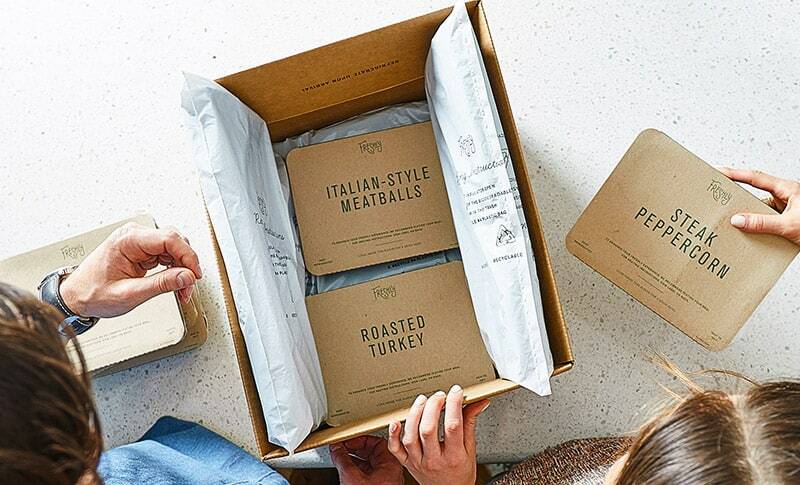 While we’ve talked a lot about the importance of green packaging when it comes to meal delivery services, one company beats all the competition — Terra’s Kitchen. Why? They deliver their meals in a refrigerated “vessel” that is immediately returned to them once you’ve packed away all of the ingredients they’ve sent you. This means no need to recycle because almost every aspect of their package is reused. They also focus on health by centering all of their meals around the Mediterranean lifestyle. This diet is inspired by the eating habits of Greece, Southern Italy, and Spain in the 1940s and 1950s where they ate mainly fruits, vegetables, fish and whole grains, while limiting unhealthy fats. There are some pretty huge health benefits associated with the Mediterranean diet, such as reduced incidence of cancer, and Parkinson’s and Alzheimer’s diseases. One of the more unique aspects to Terra’s Kitchen is that they encourage the process of cooking and eating to be a family activity. They even go as far as adding talking topics on their recipe cards to encourage great conversations. Want to cook meals as spectacular as Martha Stewart’s? Marley Spoon can help. They teamed up with Martha herself to bring you curated meals that are up to her high standards. If you’re looking to impress your friends or family with your cooking skills, Marley Spoon is the way to go. Their recipes are a notch above many of the other meal delivery services out there, making them a great option for people looking to up their cooking game. Each of the meals we tried was incredibly unique and delectable — just the way you’d expect Martha Stewart to make it. If you’re looking for the “no frills” version of Marley Spoon that’s cheaper but still delicious, you should check out their sister company called Dinnerly. They send meals for as low as $5 per serving! If you want to compare all of the meal delivery services listed here in an easy to read table, click here. Not a huge fan of Terra’s Kitchen.. Yes I do like the vessel idea but ALL of the ingredients is sent in plastic. Doesn’t that defeat the purpose of being sustainable??? More food kits like these need to focus on what is inside of the packaging too. I do like that Sun Basket is fully recyclable (as they say on their website). I will have to give them a try next. Tried Freshly! Surprised at this one actually…. You’d think it’d be like a frozen dinner but not really. It’s more like really good leftovers you reheat when you want lol. Been getting Home Chef boxes for the past month. What do you recommend as a good meal box for a family of 5? 2 adults, 1 teenager, 2 young kids. Quick and simple to prep meals are appreciated. If you’re looking for quick, simple, and inexpensive, check out Dinnerly. If you’re looking for quick, simple, and a lot of variety, check out Sun Basket.